It's snowed overnight! Yay! Our little boy cannot wait to go to the park. He is positively, absolutely BURSTING with excitement! Grandad is in bed, reading. It seems he is no rush to see the snow and go to the park. He'll be ready when he's ready. In no time, the little boy is dressed, has cleaned his teeth and is at the door waiting to be the first one out on the snow. Grandad has just made it to the shower, and reminds his grandson not to forget his scarf. Oh dear, there goes the first kid across the snow. But at least they'll be ready in time to go down to the park with all the little boy's friends. Uh-oh! No, they won't. Grandad's still dressing. So now all the kids are at the park (except for our little boy) and so are the dogs and cats. At this rate all the zoo animals will be there before our hero and his grandfather make it. What? The zoo animals? Surely not? 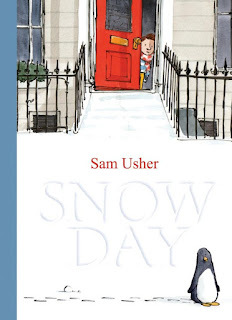 Sam Usher perfectly captures the impatience of a child just DYING to go on an adventure, in both words and illustrations. We've all had a child tell us that 'everyone' is doing something, and Grandad's response is probably just like ours! But wouldn't it be fun if just for once the child was actually telling the truth? Imagine the sheer happiness you could experience if everyone really was at the park on snow day! A delightful tale for grandparents and their grandkids to cuddle up with and read together.